I’m one of millions of home bakers who, after failed attempts at making crusty bread, achieved the impossible with the New York Times’ No-Knead Bread recipephany created by Jim Lahey (owner of Sullivan Street Bakery) and turned viral by Mark Bittman (big-time food writer). 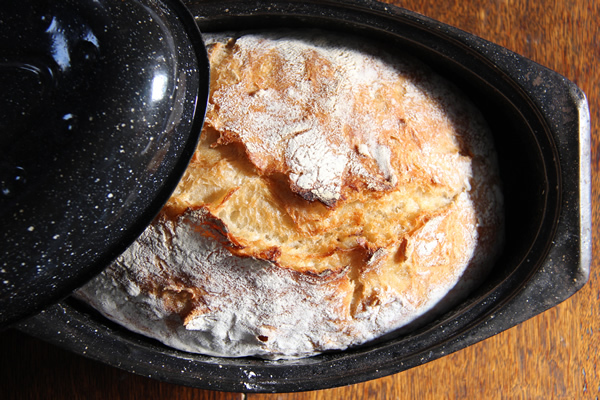 With no special ingredients or equipment, this phenomenal bread essentially makes itself. It has the holey, airy, chewy and crusty goodness of a European-style loaf from a respectable bakery. We use this for everything, from sandwiches, bread pudding, and bruschetta to (in its last gasp) toasted breadcrumbs. Once a week I stir up the dough after dinner, then bake it the next morning or early afternoon. The toasty aroma and the crackling it makes as it cools raise the cozy quotient of the house, especially during our recent record-breaking snowstorms. You get a lot of leeway with this technique. The gluten develops into such stringy strands during the long rise that you may not be able to tell the difference between all-purpose and bread flour. 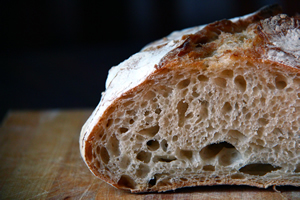 If you shorten or extend the rising time by an hour or two, the bread most likely won’t care. But there’s one immutable requirement: a pot with a tight fitting lid, often called a Dutch oven. Don’t ask me for the science, but I think it has something to do with increasing the humidity around the loaf. Happily, you don’t need to put a Le Creuset on your Christmas list. My white speckled, 13-inch oval black-enamel-over-steel Dutch oven I got decades ago works like a charm, despite its light weight. One just like it (Granite Ware roaster) today costs only $13. This recipephany feels like a throw-back to neolithic times. I can see early bakers swirling the sticky dough with their hands, then letting it collect wild yeast from the air until it gets bubbly. After they form it into a ball, they leave it to grow high before they plop it into a small stone oven. Whenever they bake it, it’s okay—nobody is watching the sundial. If you haven’t already seen it, take 5 minutes to view Mark Bittman’s famous New York Times video that upended the baking world. Here is my adaptation of this marvel, which makes a slightly larger loaf than the original. I add just a dash of honey to reward the yeasties for all their labors, since they are the ones saving us the work. 1. The evening before. Mix dry ingredients and honey in a large glass bowl with a wooden spoon. Pour in half the water and stir a few turns. Add more water and stir just until it becomes a mass of sticky, spongy, lumpy dough, with all the flour barely incorporated. If it’s too dry, add a dribble more water. It should grab onto the spoon and not want to give it up. Cover bowl with plastic wrap and let rise for 12-18 hours at room temperature. 2. Morning or early afternoon (you have a lot of leeway here). Dough should be full of bubbles and still a little sticky. Sprinkle flour over it to keep it from sticking to you and fold dough over on itself gently a couple of times, still in the bowl. 3. Generously flour a cotton towel (not terry cloth). Adding just enough flour to keep it from sticking, form the dough gently into a ball. To get good oven spring, you need enough surface tension so that it holds its shape. Put onto the center of towel. Flour top of the dough, and fold the towel over to cover it. Let it rise about 1 ½ hours or until double in size. 5. When dough is ready, take the pot out of the oven and uncover. Quickly invert the cloth and dump the dough into the hot pot. Don’t worry if dough is scraggly or if some has stuck to the towel and you have to break gluteny strands to release it into the pot. If dough doesn’t go in straight, shake the pot a couple of times to better distribute it. It is very forgiving. Slash top with a sharp knife lengthwise to help it crest. Cover and bake 35 minutes. 6. Take off lid and brown another 5-10 minutes or so, depending upon how dark you like your bread. 7. Take out bread and let it cool (and listen to the crackle) for about an hour before cutting. Reheat leftover bread the next day(s) for best flavor and texture. NOTE: Since I posted this, I took out the instruction “Let it sit for 15 minutes” at the end of Step 2. This rest seems to relax the dough and make it more difficult to form into a ball. I also changed the range of water, since the amount you use depends upon the humidity in the house. In the winter I use more than in the summer. I now recommend slashing the top with a sharp knife, which helps give it a nice crest. Finally, I found a dough whisk for a buck at Goodwill and love it. It saves most of the work—cleaning the wooden spoon. A friend of mine who was trained as a chemist has been tinkering with this recipe ever since I showed it to him. He now uses sourdough starter and some other elements, of which I want to mention two. First, he uses a little sugar (which does the same as the honey, meaning it helps the yeast grow although it doesn’t alter the H20 content). The original recipe didn’t have either– it was flour, salt, water, and yeast, I think. Second he adds 20 grams of olive oil (not sure what that is in volume) which he says adds to the elasticity of the dough and helps the rise and the bubbles. Leah, sorry I just discovered your comment. Thanks for passing on the insights. I know you have had success with this bread way before I posted it. I bet the sourdough adds great flavor. I’ve been afraid to add oil, but will try it. Thanks, I really appreciate your scientific eye!